Jay performs a fun song while his clarinet shrinks. You probably don’t know this, but I’m a musician. In fact, I like music so much that I almost majored in musical performance at college instead of filmmaking. It’s been about 4 years since I’ve played any music, but I just bought a keyboard so I’m finally getting get back into it. I figured I’d celebrate the occasion by posting a video of my favorite musical performance. In this video, I play song called “Immer Kleiner”, composed by A.Schreiner, accompanied by the Bradford High School Symphonic Band. The title translated to English means “Always Smaller.” If you watch closely, you’ll understand why it’s called that. 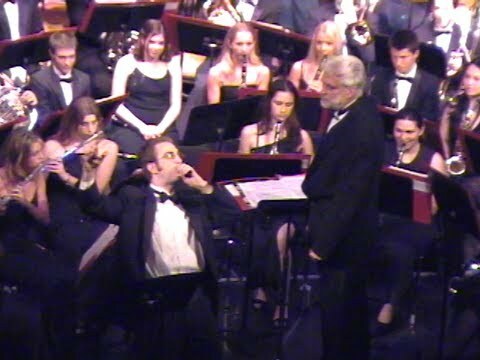 And of course, I add a bit of silliness to the performance with the help of my teacher. This was performed in May 2003 in Kenosha, WI. It feels good to be returning to my roots. Filmmaking and music have been missing from my life for far too long. And don’t worry, the game is still coming. I’m just glad it’s not the only thing I’m doing any more. Man, Jay, you have a good pair of lungs. I didn’t know you were a Wisconsinite! We rule!